This issue has my favorite cover of any comic in recent memory. We still don’t get the full picture of what is Olive’s beef with Batman, but we do get hints of it. Batman shows up mysteriously in a couple panels. Karl Kerschl surpasses last issue by filling this one with large, sweeping panels. Olive and Kyle sitting together on the dock looks so picturesque, it should be a poster. The lighting in that panel is perfect — kudos to the colorist team. Kerschl shows off his capable use of multiple camera angles in that scene: zoomed out on Olive and Kyle, zoomed in on each of their faces, overhead view of them looking out at the water. They make quite the cute couple. 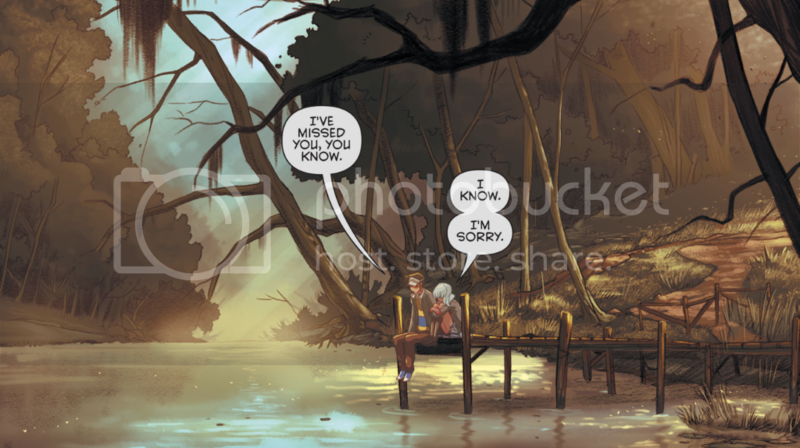 Pomeline continues to get a fair amount of focus in this issue. We see her partner with Olive and Maps to investigate the North Hall, the spooky, sealed-off area of campus. It’s wise of Becky Cloonan and Brenden Fletcher to show Pomeline partnering with our protagonists, and not just showing her as a mean girl trope. It’s proof that the writers are committed to showing these characters as multifaceted, non-typecast people. There’s a great mini-moment of jealousy when Pomeline isn’t thrilled about her boyfriend, Heathcliff, greeting Olive. Olive and Heathcliff have a brief time of talking alone, before it’s swiftly interrupted by Kyle. We finally hear from Kyle more than a solitary sentence! And we finally learn the reason behind Olive and Kyle’s breakup, and get a major reveal about what’s going on in Olive’s life. 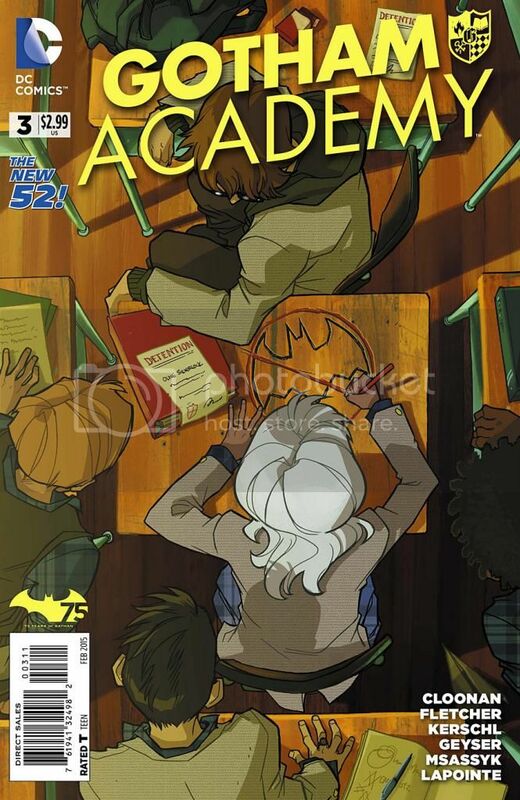 I’m glad that Cloonan and Fletcher are introducing difficult family situations into Gotham Academy. I bet many readers of all ages will be able to relate with Olive. Colton Rivera is a hilariously fun character. He insists on wearing sunglasses at all times, including indoors and at night. He has skills at lock-picking and boosting parts from cars, of course. Olive aptly introduces him to Maps as the “school liar.” Every cast needs a mischievous character, and Colton plays that role with aplomb. 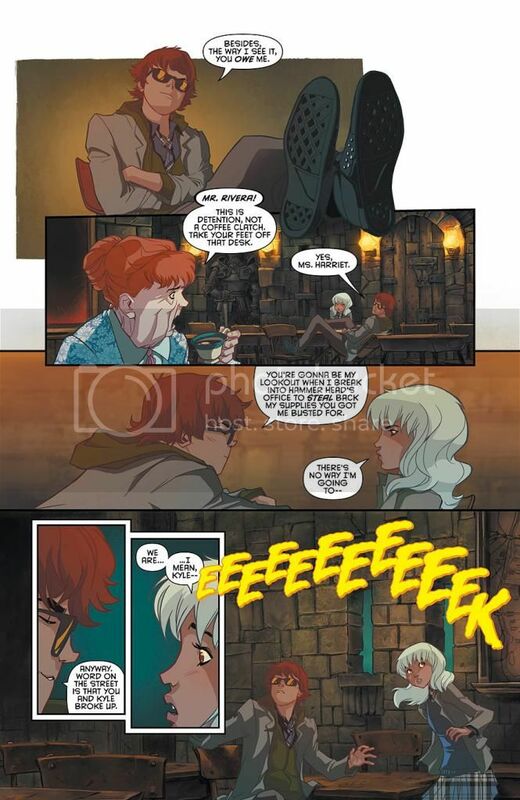 We learn that Gotham Academy is indeed haunted by a ghost: the ghost of Millie Jean. Olive posits the mature realization that maybe Millie Jean wasn’t crazy, but was shushed because she knew too much. I like how Olive carries the story with such an interesting and intelligent persona. Maps gets a few shining, adorable moments, too. Maps’ desire to be included in everything is very true to what a younger sister would be like. It’s touching to see Olive treat Maps well. Mysteries still remain from last issue. What’s the deal with that guy who was drawing Maps? Who is the mysterious blond boy with the Gambit-like red eyes? We do learn Maps’ given first name, Mia. Cloonan and Fletcher continue to pack our new favorite prep school with secrets and clues, and this installment has some of the most visually stunning moments yet.